Since 2009 an incongruous outsider has dominated one of the most crucial views in Venice. The obtrusive guest is this blindingly white sculpture of a boy with a frog by American artist Charles Ray. 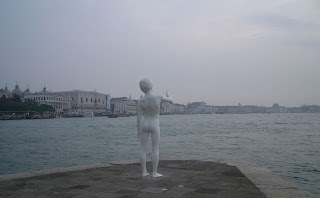 He’s been placed at the Punta della Dogana, the tongue of marble that juts out into the Venetian bacino, once the perfect vantage point to drink in the Piazzetta of San Marco, the sweep of the Riva degli Schiavoni, the island of San Giorgio Maggiore. To the left are the grandest palaces of the Grand Canal; to the right the lozenge of Giudecca melts into the lagoon. It was once described to me as the most perfect place to kiss in Venice. But now all kisses are supervised by an outsize naked boy. Boy stands like a Roman, legs spread. He’s eight feet tall – but his proportions are those of a child, creating, for some, an uneasy paedophilic aura. In one hand, the blank-faced boy clutches the limp frog, which seems to be dead. The frog hangs upside down, like the dead Mussolini suspended in front of the hating crowds. And American art critic has praised the work as enigmatic and beguiling, a manifestation of shape-shifting, seeing it also as 'at once Greco-Roman and hyper-real'. According to this critic, the figure 'casually invokes time'. No wonder so many Venetians hate the statue! Even if they don’t subscribe to this insulting interpretation, their favourite passeggiata culminates in a view of the lagoon filtered through the boy’s shiny buttocks. There have been repeated promises to remove the sculpture, which offends so many, and restore what was there before him: one of the romantic lamp-posts that shed a sweet rose-coloured light around the city by night. This was uprooted in 2009 to make way for Boy, and has never been seen since. Meanwhile, Boy has stayed in place. Another Venetian has explained to me that the statute has been ‘bait’, drawing the crowds to the point of the Dogana, where the owner of the sculpture, French millionaire Francois Pinault houses part of his art collection. I will say that his financing of the restoration of the Dogana, or Customs House, is a great boon to Venice, and it was carried out with remarkable sensitivity by the Japanese architect Tadao Ando. Boy was placed in front of the museum to mark the festivities of the opening, and it was thought that he would be removed soon afterwards. He was not. However, I am happy to report that the buttocks shall soon have a happy ending. A former councillor for the ministero per i Beni culturali, Franco Miracco, recently wrote a hard-hitting letter to the Venice’s Comune and Soprintendenza ai Beni artistici e architettonici. He asked a simple question: what had happened to the authorization to leave the statue standing in this place? It has been announced that from March 18th works will commence to remove Boy from his position. His destination is unknown, possibly away from Venice. And in his place will be erected a lamp post created from an original 19th-century mould in Mantova. It will be funded by a consortium of lighting companies. I would say that this not just a gift for the nostalgic or for the romantics. This is history reasserting itself. Nineteenth-century history, as the original lamp dates back only to then, but living history in that the image of that lamp is held in the memories of living Venetians, those who loved to walk to the Punta della Dogana, those who loved to kiss there. What a wonderful title for a blogpost. Wherever he goes, I do hope he gets known as boy with buttocks and frog! Lovely post...rather unlovely statue and I'm glad he's being moved! Must be fun thinking of a suitable remark to scrawl on that buttock. Even if it proved impossible in the end. Venice could have held a competition in the newspaper or on Facebook! What excellent news! I have never seen anything more out of place than that weird statue - and the bored guards pacing around. This sounds like a victory for common sense. A romantic 19th century lamp post will be perfect. The cage looks dreadful. The statue itself (apart from the fact that I feel worried for the frog, and the way he's holding it seems cruel) might look all right somewhere else, but I'm glad it's being removed from that lovely spot. Totally distracting! So glad to hear he's going. I can quite see why he's off-putting to prospective kissers! Glad to hear something a little more in-keeping will be replacing him. Boy with buttocks and frog seems the perfect title for a book Michelle. And in defense of frogs, I'm glad he's going.